3/25/16 “Good Friday” - Morning Prayer @ 8:45 AM followed by Confession. of SENIORS……Lou Fabiano assumes Presidency. 6/13/16 - (all day) 14th Annual Golf Outing (Old Brookville CC)- honors Mercedes Colwin & Ed & Janet Lee….major Parish fundraising event. 7/15/16 Deacon Jim Murphy visits St. Pius X parish on behalf of missionaries who work in Diocesan missions in Dominican Republic. 7/29/16 Columbiettes hold “Tag Sale”. 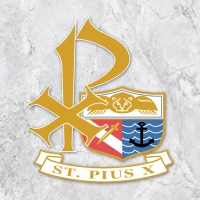 8/24/16 to 8/28/16 – 2016 St. Pius X FEAST …..”SAVE THE DATE”!!! 9/8,9,10/16 evenings..2016-17 Boys/Girls BASKETBALL Intramural League registration; (also “online registration”). available for each Parish Family. costumes and enjoy CRAFTS, PIZZA, CANDY, DANCING. 12/11/16 Sun. 4PM….St. Pius X’s “12th Annual Christmas Pageant…..
“The Story of Christmas” presented by Children of our parish & Adult Choir. 3/4-5/17 “Project Soup” Youth collect cans of SOUP for needy…429lbs collected. 3/28/17 Tuesday “Day of Adoration” ) sign-up sheet in CHURCH FOYER. Novena to the Immaculate Conception: Every Monday following the 8:45AM Mass. Rosary: Monday – Saturday following 8:45AM Mass. 10:15 AM in the Church; and the last Tuesday of each month from 9:15AM to 7PM. Care of the Sick: Please notify the Parish Office if there is any parishioner who is ill at home so that we may administer the proper spiritual care. 2018 MASS BOOK: Offerings for 2018 Mass Intentions will be accepted in Parish Office commencing WEDNESDAY, MAY 31, 2017. June 2017 - Fr. Valentine requests “NOMINATIONS for the PARISH COUNCIL”. SEE: BULLETIN for “Nomination Form”. Novena to the Immaculate Conception: Every MONDAY following the 8:45 AM MASS. Rosary: Monday – Saturday following the 8:45 AM MASS. YOUTH GROUP (All HS Youth WELCOME!! )@ St. Pius X Parish……. Sundays, 6PM Madonna Hall ……DINNER! FUN! GAMES! FAITH FORMATION REGISTRATION (2017-2018)…REGISTER NOW!!! PIUS X YOUTH CHOIR - MONDAY NIGHTS (CHURCH) @ 7PM…. 9/19/17 “Welcome Back” SENIORS Luncheon @ Woodbury CC. register before: 10/9/17 - DRVC “GOLDEN WEDDING LITURGY”…..
10/17/17 SENIORS – Ron Bauer, speaker on energy; Flu Shots available. 10/24/17 Death of Father Hugh Cannon, fifth Pastor of St. Pius X Parish. REGISTRATION for TRYOUTS……”deadline” > October 29. YOUTH GROUP “Open House” following 5pm Youth Mass. PRE-SCHOOL Bible program – Children ages 3-5 (next class- 11/5). Cathy Polz, Steve Rhoads, Phil Saglimbene, Nicholas Sallie, Claudia Stewart, Fr. Valentine. “Book of Remembrance”- to be displayed near baptismal font from 11/1 – 11/23 (Thanksgiving Day). We invite you to write in this book - NAMES of deceased loved ones. “Proud to be a Catholic” car magnets available at Masses (weekend of October 28/19). Month of November: Youth Group is collecting warm coats for those in need. Bins will be conveniently located in Church Foyer, Faith Formation office, Parish Office. Bakers are needed for our Bakers Ministry. This ministry includes volunteers to bake cookies/cakes as an offering of consolation for those who recently lost a loved one. Registration for: 2017-18 St. Pius X CYO Basketball Intramural League/…REGISTER NOW!! >> BOYS grades 5-12 in Fall; GIRLS grades 5-8 in Fall; BOYS/GIRLS grades 3-4 in Winter. St. Pius X CYO 2018 Girls VOLLEYBALL: Grade 5 – High School...REGISTER NOW. Bereavement Ministry (“Bridges to Hope”) ….Coping with the Holidays> Sunday October 29, 1:30 – 3:30pm…Room 1 @ St. Pius X School. Nov 19 Sunday – YOUTH MASS 5pm..ALL : Grades 5,6,7,8 Level Students participate. Nov 21 - INTERFAITH THANKSGIVING SERVICE – 7pm, hosted by Church of the Latter Day Saints. ADVENT SEASON 2017 Pick up copy of “THE LITTLE BLUE BOOK” which offers reflections for Advent and Christmas seasons….Copies in rear of Church. 12/3/17 BREAKFAST with SANTA (KofC) 9A-12:30P….Adults: $10. 12/9/17 (Saturday) KofC St. Pius X Christmas Party 6PM Madonna Hall _____ ALL parishioners invited!! $25. per person. RSVP: Jim Albert=(516)293- 4685 by 12/2.